For those getting into bbPress for hosting your own forum, customizing your bbPress theme files can be difficult if you don’t know which page to load. Many of the bbPress theme template files contain enough clues to figure things out, but not every template file is used by default, or even at all depending on how you’ve configured bbPress. Themes may contain different template files, but the default “bbPress (Twenty Ten)” theme (included with version 2.1.1) may be considered a complete set. 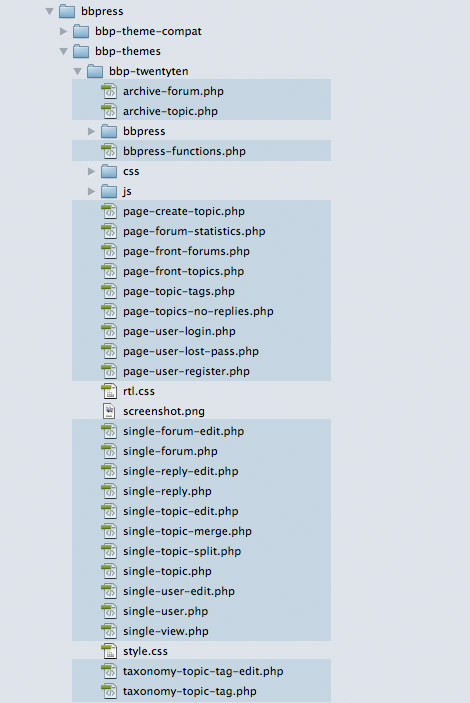 This isn’t a template hierarchy, just a list of main template files included with the default Twenty Ten theme. Along with any important notes, an example URL be included for each file. So to view any of these files, edit the example URL to something similar that exists on your site. If you’re working with a new installation of bbPress, you may need to create some “test” forums, topics, and replies to invoke all of the different template files. So without further ado.. I hope this helps! I’m not a bbPress expert so plz don’t stone me if I missed something obvious (or not so obvious). Cheers! I have a rather large bbPress 1.1 forum I’ve been putting off moving to the newer plugin version just because I know it’s going to be a lot of work getting everything tweaked just right. This post makes the theming part of the job much easier. Thanks! I agree! Thanks for the snippet! I’ve used bbPress on a couple of sites, but I found laboriously painful to modify, so I’ve been leaving it alone and tweaking styles here and there. It doesn’t seem to bother the average user as much as it does me. I’m about to create a new site using it, so I’ll have another look under the hood and see what ‘improvements’ i can make. Thanks for taking the time to write this up, Jeff! Very helpful to me this morning!